Tuscany conjures thoughts of the apogee of rich living. Its picturesque villages, graced by grand villas and their pools, serve as summer homes to the jet set. It is hard not to conclude that it has always been like this. Renaissance towns and castle-sized farms from the same period are a global benchmark for civilised living. How can it ever have been different? But Tuscany was not always home to the affluent. For much of the 20th century its farmers were poor, scratching out a modest living from its impoverished heavy soils. In Roman times, for example, it boasted no noteworthy towns and, though as close to Rome as the Bay of Naples, the great and the senatorial good seldom built summer retreats here. Of Tuscany’s Roman towns, places like Lucca, Roselle, and Siena prospered under the early Empire, but never grew into metropolises. Few places indulge the modern senses better than the rolling hills south of Siena, reaching around the verdant flanks of Monte Amiata. I am visiting my wife’s project – the Roman Peasant Project – at Poggio d’Amore near the hilltop village of Cinigiano (inland from the coastal town of Grosseto) and she has left me in charge as she rounds up the team on Day One. Poggio d’Amore, the so-called ‘hill of love’, is apparently where the donkeys were brought to be paired off. My task, by comparison, is simpler: I am to work with the village bulldozer driver, a lugubrious man, unimpressed by this diversion from digging ditches. He is charged with machining a trench across the hillside where my wife’s collaborator, Mariaelena Ghisleni, found a thin scatter of abraded late Republican Roman potsherds. I must make sure he does not shovel away the important archaeological levels. The tell-tale sherds found by Mariaelena suggest the presence of a small farmstead like others they have excavated near Cinigiano in two previous seasons. Signore Macchetti, the farmer who owns Poggio d’Amore, is excited by the prospect of the company of young foreigners for a few weeks, and has willingly permitted the dig as long as it is back-filled. Digging in Italy always feels like being in an opera. Today was no exception. As I parked my car in the farmyard, Signore Macchetti greeted me in his fine melodic baritone voice. He is a big-boned man with a ruddy complexion and avuncular manner; after musing on the weather, he asks me if I know anyone who would like to buy the farm. His father had passed away in the spring and with only a widowed mother to care for, his thoughts have turned to retirement. This land had given them a good living in the past but not now. His crops made little in the market; the incentives no longer existed. On this bright day, it was a bleak view of farming life, somewhat consistent, you might say, with digging a farmhouse that belonged to the age of Spartacus. But he perked up when I mentioned the impending arrival of the dinky red bulldozer on a truck. ‘He’ll get stuck, mark my words,’ he said, plainly hoping his prediction would come true. Sure enough, the truck promptly fell prey to the only mud within a great radius, and, after much hand-waving and vigorous cursing, act two of the opera ended with the farmer riding to the rescue on a vintage tractor. This little dig on the hill of (donkey) love is far from an operatic gesture. The Roman Peasant Project aims to understand the ways of life of the 90% who made up the Roman world but seldom if ever figure in the histories of the period. In recent years, thousands of scatters of Roman farmhouses have been found in systematic field surveys throughout Italy and indeed throughout the Mediterranean. But, strangely, almost none of these unprepossessing dots on maps have been excavated, and no-one has excavated a group of such sites within a specific field survey area. As a result, most archaeologists and historians look at the survey information as a reflection of peasant life, with places going on and off like traffic lights. The conventional interpretation of the Italian surveys is that the majority of sites belong to the Republican Roman period, with many being abandoned by the 3rd century, before a modest revival in the 5th century. But, in truth, this is conjecture, and Romanists hotly dispute the demographic history of the age, as well as, for example, the role of the market in peasant life. Of course, notwithstanding the pleasures of working in the glorious Tuscan countryside, after ten minutes at Poggio d’Amore I could understand why, misguided though they definitely are, Roman archaeologists have concentrated their efforts on temples and villas. The lugubrious machine-driver put his mishap with the mud behind him and settled into doing my bidding. He quickly opened up a tract of the hilltop about 2m wide by 20m long. In the first ten minutes he struck peasant gold. Well, I exaggerate: this was a shabby little wall of water-rolled boulders beyond which lay vestigial traces of a beaten surface. Potsherds dotted the ground: perhaps 30 fragments. Lower down, where the scatter of ploughsoil finds had been plotted by Mariaelena some winters earlier, there was nothing. The driver was plainly puzzled to be doing this. This was the first of four such excavations my wife made this season with her remarkably tenacious colleagues and a cohort of indefatigable students. Ten days of digging on Poggio d’Amore revealed the barest outline of a late Republican dwelling, less substantial than the one found the previous year at San Martino on the other side of the rolling hill, but no less interesting. Each tell-tale stone and potsherd, as well as the minuscule chips of glass, holds a story that once threaded together becomes part of a ground-breaking tapestry. Seeing this place through the eyes of the present farmer, I could comprehend the real challenge of life on these indifferent soils. 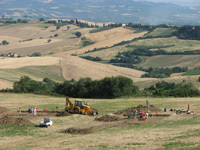 The second farmhouse excavated at Podere Terrato this season was more substantial. Situated in amongst luscious cornfields today, its several rooms, some perhaps for storage, as well as the discovery of a handful of corroded bronze coins, reveal an altogether higher class of Roman living. Or does it? One theory the team are considering is that not all the farms were occupied at once. Some, like Poggio d’Amore, may have been seasonal sites while others, like Podere Terrato and the more substantial Pievina with its granary (excavated in 2009 on the outskirts of the modern village of Cinigiano), were permanently occupied. Using a plethora of techniques, the team are trying to prove this highly significant theory. In a nutshell, what it means is that ploughsoil scatters of Roman pottery do not necessarily equate to permanent Roman households. For historians of Roman demography this is, of course, explosive stuff. Perhaps the most fascinating discovery this season, though, was… a drain. A scatter of potsherds on a steep hillside suggested a farm of Poggio d’Amore proportions. As always, Mariaelena followed up with a geophysical survey of the slope and found nothing that could be readily identified. So a machine was summoned and a long trench was carved down the slope to reveal an elegantly made field drain. Neatly set in its own trench, it was intended to take heavy water efficiently off the hill, consigning it to a deep gully. The discovery of the drain drew an audience of admiring peasant farmers. All confirmed its purpose and speculated upon its antiquity. Ancient sources like Varro speak of the importance of managing farmland with drains, but when was one ever found? The elegant tract of field architecture was entirely unexpected. This said, I championed its discovery to a visiting Roman archaeologist (taking a day out from the excavation of a major Roman villa) and the glazed, befuddled look I received said it all. Modern peasants may admire such artistry; modern Roman archaeologists seldom do! The Roman Peasant Project has a long way to go until its work is completed. In 2012 they will tackle a Roman roadside village, while pursuing their detailed studies of the geomorphology and the past vegetation. The study of the rubbish found on sites like Poggio d’Amore is beginning to demonstrate a vibrant local market, with connections reaching to the Roman hilltop town of Roselle. But most of all, this project forces one to rethink the Roman age, and the far from indigent norms for the majority of its farmers. Ancient standards of living, however, once the digging day is done, are quickly forgotten. Cinigiano is a picturesque working town with dark, shaded alleys leading around its defunct castle. Occupying its little piazza, beneath a baroque bell tower, where swifts dip and dive to snap up bugs, there is a quintessential Tuscan osteria – ‘Il Rintocco’ – run by the urbane Fabio, whose gastronomic magic is famed throughout this region. Here, under the stars, eating a modern variant of peasant food, you can feel as if you belong to the jet set.